The No. 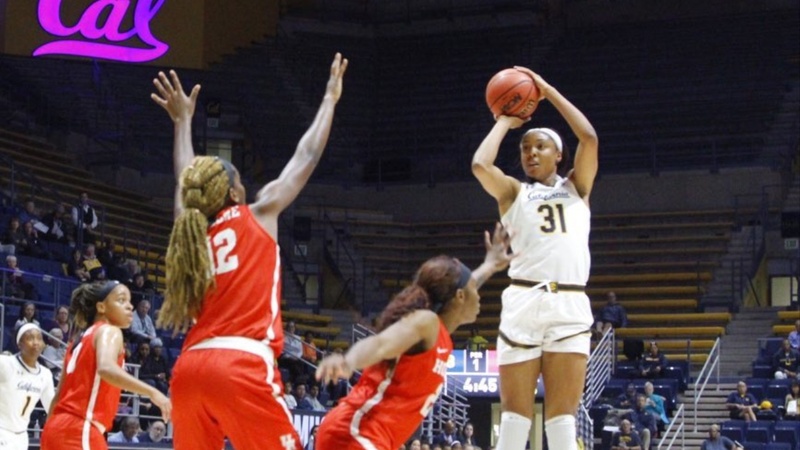 24 California Golden Bears opened their 2018-2019 season with an exciting win over Houston, 80-79. "Houston is a really good team, a team that won 20 last year, and returned 96% of its scoring," said Cal head coach Lindsay Gottlieb. "And they all got better. We didn't take the easy path to start our season, and I'm really glad for that." The Bears nearly wasted a terrific performance from Kristine Anigwe. Despite early foul trouble, the senior was dominant, carrying Cal with 37 points and 13 rebounds. At one point Anigwe, hit 10 straight baskets; her 21 points in a quarter (the third) is a Cal record. "Kristine was a beast and really showed why she's one of the best, if not in the conversation for the best player in the country," said Gottlieb. "The weird thing is, that's kind of what we expect her to do. You start to see extraordinary things become ordinary." Anigwe also hit all 11 of her free throws. Asha Thomas and Jaelyn Brown helped Cal's cause with some clutch free throws down the stretch, and each finished with 10 points. Thomas contributed a game-high seven assists. "AT had seven assists and one turnover, against that amount of pressure," said Gottlieb. Thomas also grabbed six rebounds of her own, more than any Houston player, while Brown had eight as Cal dominated the glass, 43-29. "I try to use my athletic ability as much as possible to do whatever is need on the court," said Brown. "Today it was rebounding." CJ West had eight points in 10 minutes of play, and freshman McKenzie Forbes had six. Newcomer Recee Caldwell struggled in her Cal debut, notching eight of the Bears' 21 turnovers. Jasmyne Harris led Houston with 17 points, and Angela Harris and Serithya Hawkins each had 12. Against an aggressive Houston defense, Cal struggled to make passes and were forced deep into the shot clock to open the game. Kristine Anigwe fought through a double team down low to grab her own miss. Her putback got Cal on the board. Anigwe also fought hard for position on both ends, forcing three quick fouls on her defenders. Cal played strong defense of their own, forcing Houston to miss their first five attempts. Alyssa Okoene's putback got the Cougars within 8-2. The Bears crashed the glass hard early, grabbing nine i the first six minutes, including four on the offensive glass. McKenzie Forbes scored the first points of her Cal career seconds after checking in, on a well-designed out-of-bounds play. Houston's in-your-face defense began to rattle the Bears, who in addition to struggling on offense, began to lose their assignments on defense. A three-point play by Serithia Hawkins capped a 11-4 run for Houston, and the Cougars edged ahead 13-12. "It's hard to simulate it in practice," said Gottlieb of Houston's pressure. A three by Angela Harris closed the period with Houston ahead 16-15. Another three-point play, this time from local product Doris Jones, kept Houston ahead 21-17. Only Anigwe kept Cal afloat on offense, but she soon went to the bench with her third foul, with 6:25 left in the second period. Unable to find any access inside, Cal was forced to heave from beyond the arc, with no success. The Bears missed their first 10 attempts from three. Forbes gave Cal a lift, chasing down a long rebound and attacking along the baseline for a basket. She then drove into the key and found CJ West underneath, tying the game at 23. The two sides traded the lead, with West scoring twice more for Cal. With six seconds left, Dorian Branch turned a rebound into a coast-to-coast score, and Houston had the 30-29 edge at halftime. Branch and Harris each had six points for Houston, while Anigwe led the way for Cal with 10. The Bears suffered from 13 turnovers and poor shooting (32%). The third period started in controversy, and after a review, Houston was charged with a technical foul. Asha Thomas hit a free throw to tie the game. Houston came right back with more intensity and hustle, converting another Bear turnover into a basket and regaining the lead. Cal rode Anigwe to keep pace, and the senior responded with 10 straight points for Cal. Two more Anigwe baskets edged Cal ahead 46-42. Cal began to play better defense in the halfcourt, moving their feet and cutting off drives and forcing five Cougar turnovers. Houston still managed a couple of scores by outracing the Bears down the court, but Cal was starting to take the fight to Houston. Jaelyn Brown said that Gottlieb reminded the team at halftime that they could also attack the pressure. "There was so much, but once attacked the pressure, it was open." Another flurry by Anigwe, this time a personal 7-0 run, and Cal's lead was at nine. Recee Caldwell knocked down a double-clutch corner three to complete the Cal 14-2 run over three minutes, and Cal was ahead 56-44. Cal committed only one turnover in the third. "I was just trying to win," said Anigwe. "I felt that the whole game, we kind of battled. I wanted to capitalize on their mistakes, and I wanted us to create a gap so we could have the advantage in the fourth quarter." Houston amped up their defense to open the fourth, once again slowing down the Cal offense. A three by Angela Harris narrowd the gap to 62-57. Jaelyn Brown, who had focused on rebounding and taking charges all game, then looked for her offense. The junior knocked down an elbow jumper and a corner three, restoring Cal's lead to double-digit, 67-57, with 7:30 to go. "I knew it was going to come," said Brown about the shots being available to her. "Whether it was in the first quarter or the third or whenever. With Kristine doing so much in the post, it opened up shots in the perimeter. We just had to knock them down." The Cougars continued to claw back. A three by Angela Harris closed the gap to seven, and Gottlieb compounded the problem, getting assessed a technical, which resulted in two Houston free throws. Another Cougar free throw, and the lead was down to 73-69 with 2:28 to go. "I think we made things tougher on ourselves at times," said Gottlieb. A quick missed three by Cal led to a breakaway layup on the other end, and it was a one-possession game, 74-71, with two minutes still to go. Asha Thomas kept the ball on the next two possessions, and the senior knocked down four free throws to keep Cal ahead. Angela Harris hit a three to keep it close, 78-74. On the other end, the Bears found Anigwe under the basket, but Houston stripped the ball and gained possession with 24 seconds left. Cal played solid defense and forced a long three from Houston, but Recee Caldwell fouled Harris on the attempt. Harris hit all three free throws, and it was 78-77 Bears with 11 ticks left. Cal used time out to advance the ball, and the Bears got the ball to Brown, who was immediately fouled. Brown hit both free throws, giving Cal the three point lead and Houston one final chance to send the game to overtime. Jasmyne Harris just missed a three, and Tatyana Hill's putback beat the buzzer, but the Bears escaped with the win. "I love the feel of the team the whole game," said Gottlieb. "They were completely locked in and with me. Houston presented a big challenge, and we did what we needed to do. Just really proud of the whole team." Cal now goes on its first road trip, matching up against Penn State (November 11) and BYU (November 13).